TN Congressional candidate: "Make America White Again". The billboard of a Tennessee restaurant owner running for Congress reading "Make America White Again" has drawn criticism from Polk County residents. The website says the billboard on Highway 411 could "make a major splash:"
"The Make America White Again billboard advertisement will cut to the very core and marrow of what plagues us as a nation. As Anne Coulter so effectively elucidates in her book, Adios America, the overhaul of America's immigration law in the 1960's has placed us on an inevitable course of demise and destruction. Yes the cunning globalist/Marxist social engineers have succeeded in destroying that great bulwark against statist tyranny the white American super majority. Without its expedited restoration little hope remains for the nation as a whole." 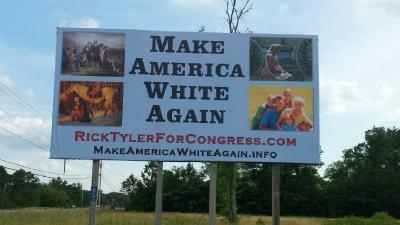 Tyler's page says the "Make America White Again" billboard was the first one of many planned for the area in the months leading up to the November election. Other billboard ideas are posted on the site, with slogans like "Fight federal tyranny / Stop the Muslim invasion" and "Mamas, don't let your babies grow up to be miscegenators." Another billboard idea depicts two hands of different races holding the other, with a circle and slash superimposed over it. On WTVC's Facebook post of this story, many Trump supporters were quick to disavow Tyler's message. Cindy Robinson said, "I'm for Trump but not for that!" Viewer Don Tate added, " As a trump (sic) supporter that is a poor excuse of a human to put a sign up like that. But that's the wonderful thing about freedom of speech at least you know what's really in their heart."